England produced a stunning performance to take a five match point haul out of Dublin as they downed champions Ireland at the first hurdle of this year's Guinness Six Nations Championship. The sides had gone hammer and tong at each other for over an hour before England began to gain a foothold and made the Irish pay time after time for their mistakes. England's lightning start brought immediate dividend, Jonny May racing into the left corner in a try created by a smart lineout ruse. Jamie George fired the lineout ball straight to Tuilagi at 12, and the Leicester wrecking-ball handed England the attacking platform. May did the rest on the short side, with captain Owen Farrell's touchline conversion putting the visitors 7-0 to the good right from the off. May's loose kick to touch handed Ireland a good attacking platform though, and Sexton slotted a regulation penalty to put the first home points on the board. Tom Curry was sin-binned for England for a late and shoulder-charge tackle on Keith Earls before Maro Itoje was fortunate to avoid a yellow card for taking out the airborne Earls. Ireland could not exploit the territorial advantage of that penalty, leaving England still leading 7-3 after 20 minutes. England negotiated Curry's sin-bin without conceding any points, but no sooner had the Sale flanker returned than Cian Healy bundled home for the Irish. England conceded a cheap offside penalty midway inside their own half, and Sexton punted to the corner instead of going for goal. Ireland vindicated the decision straight away, Healy ploughing over after the lineout, with Sexton's conversion putting the hosts 10-7 up. Uncharacteristic Irish errors gifted England the lead with Elliot Daly nipping in after Jacob Stockdale misread the Wasps star's grubber kick. England only had the platform because of Henshaw's botched clearance, with the full-back curiously opting to use his less-favoured left foot and flopping his effort as a result. Farrell's pinpoint conversion put England 14-10 to the good on the half hour, with the fly-half posting a penalty to stretch that lead by three at the break. Mako Vunipola was denied a try due to a double movement, with Farrell posting the penalty to close the half and put England 17-10 ahead. After a lively 15 minutes of the second half, the first big opportunity of points came to Ireland, Sexton slotting over a penalty to reduce the arrears to four points. On the hour mark, Farrell had a chance for another three points but he missed the 41m effort. 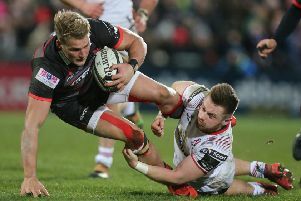 England's dominance continued and although there was some controversy when Henry Slade looked to be ahead of May when the winger kicked the ball ahead for him to run in and score a third England try - confirmed by the TMO- even with Farrell's missed conversion, the English were nine points clear at 22-13 after 66 minutes. And four minutes later the lead was 25-13, Farrell banging over a 42m penalty. Four minutes from the end any chance of Ireland getting anything out of the game were gone when Slade intercepted Sexton's pass 10m from the line, the English centre stumbling over to secure the try scoring bonus point, Farrell adding the extras for 32-13. There was a consolation at the end for replacement Irish scrumhalf, John Cooney, crossing for his first international try - Sexton converting to reduce the deficit to 20-32.